"Gotta Dance"'s NBA dance squad. 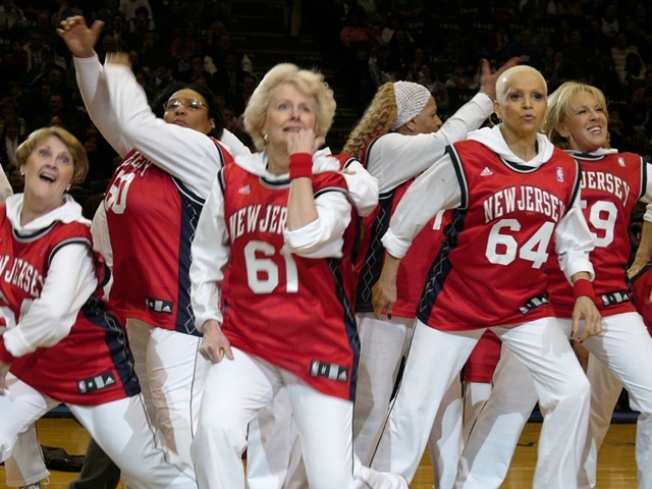 OLD SCHOOL: Call it “Young at Heart” meets the Harlem Globetrotters: Dori Bernstein’s “Gotta Dance” – a documentary about the NETsatinal Seniors, an NBA dance squad made up entirely of senior citizens – is an unabashedly aww-factor filmgoing experience. And sometimes, there’s nothing wrong with that. 92YTribeca, 7:30PM. COMING OF AGE: In “Slipping,” a high schooler shaken by his father’s violent death decamps San Francisco for his mother’s house in Iowa, a new school, and a friendship that could cut through his numbness (or send him spiraling even further). The play, written by Daniel Talbott and directed by Kirsten Kelly, runs tonight through August 15 at the Rattlestick Playwrights Theater. 8PM. SECOND ACT: In this climate, we can all use a good career reinvention story. Camilla Dietz Bergeron left her high-flying Wall Street gig to open an antique-jewelry shop on the Upper East Side; she’ll share anecdotes from her exercise in self-fulfillment at From Stocks to Rocks at the Museum of the City of New York, 6:30PM.